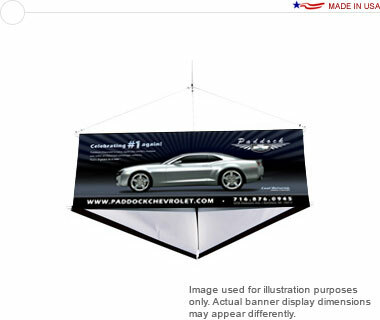 A 12′ wide 3-sided hanging banner sign display that grabs attention and can be seen from anywhere in the tradeshow or conference hall. Also ideal for large lobbies, ‘big box’ department stores and other retail environments. Assembly is a snap with the durable fiberglass frame construction. High-quality 13oz. vinyl banner printed digitally with solvent-based inks. The flat shipping rate for this package is $108.50 USD for standard delivery within the continental United States. Alternative shipping methods and International shipments are available; please contact for a quote.